She'll catch a wave of decadent diamond stones when wearing the fashionable Sterling Silver Bypass Wave Diamond Ring. 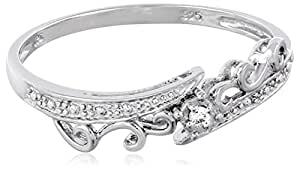 Displayed at the top of a polished sterling silver band is a unique twist on the classic bypass-style design, embellished with filigree swirls, a studded trim and a bead-set diamond stone. The faceted, round-shaped stone picks up radiant shine against the polished silver material, and holds 0.015 carats in weight. This ring was a little disappointing. I thought it would be a bit more interesting but the diamond has no sparkle at all, it might as well not even be there. Even the silver has very little shine. The ring is small which isn't bad and comfortable to wear, but for the price it should have had some sparkle. The picture was not a good representative. It did arrive quickly, no problem with delivery. Over all this ring is not much more than a silver band with a very tiny, almost invisible diamond. 5.0 颗星，最多 5 颗星perfect promise ring! 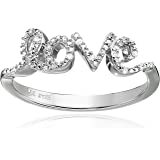 Love it..perfect for a promise ring! I am very simple and don't like a lot of flash so when it came to picking out a ring, I looked at tons trying to find the right one. This ring is delicate looking while maintaining integrity. It did seems to dull a bit, but I haven't cleaned it. I've been wearing it almost a year now, and have no complaints. It did not turn my skin colors, it does not bite my kids like my old one did, and it is beautiful. 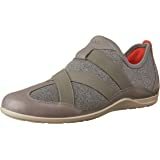 It gets compliments often and fits my personality wonderfully. It was a great choice. I purchased this item for myself. I wanted a ring that was small and inexpensive without looking cheap, and this ring fit that bill perfectly. It came packaged in a beautiful box that rivals those from expensive jewelry stores, and came with all pertinent information about the diamond. If you're looking for something understated yet classy this ring is a hit! The ring was beautiful. Unfortunately the size sent was all WRONG!!! when she tried it on it was too big we would actually need A smaller ring. 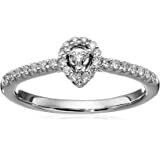 Other than that it was perfect for a thinking of you ring!